The YDP-223 combines great sound and features in an attractive cabinet that will add a touch of elegance to any home. From the moment that you turn it on and start playing, you'll be glad you made the decision to buy Yamaha, the world leader in musical instrument manufacturing. The YDP-223 features an 88 Key Graded Hammer Action. Graded Hammer Action emulates the action of a grand piano - heavier in the bass and lighter in the treble areas of the keyboard (on a grand piano, the hammers get thicker as you move from treble to bass). And nobody does this better than Yamaha, one of the most respected manufacturers of upright and grand pianos in the world today. The YDP-223 comes with a selection of 14 voices and features a Stereo Sampled AWM (Advanced Wave Memory) piano sound that feels, reacts and sounds like an acoustic. When you play harder, the sound is louder and brighter. And when you play softly, the sound is quiet and warm. The YDP-223 never needs tuning. The YDP-223 is the tool of choice for home hobbyists, professionals, music students and music institutions. There are many useful features built into the keyboard that apply to musicians at any level of playing ability. For example, the keyboard has MIDI In/Out/Thru plus a To Host jack, which are necessary for connecting to computers. Anything you play on the YDP-223 can be captured into a music program in your computer and turned into music notation. If you wish, you can send the file to your friends and family or just archive it like you would a photograph. There is nothing more rewarding than recording your child's first song and e-mailing it to their favorite grand parent. In addition, there is a 2-track recorder built into the instrument that is extremely intuitive and easy to operate. This feature is wonderful for recording a performance and analyzing it from an audience perspective. But it's not just for practicing; it's also a lot of fun! For example, you could record an Electric Piano part, then overdub a String track and finally, play a Piano part live while the other 2 tracks are playing back. It's like having your own recording studio right in your living room! The YDP-223 has an incredible 64 notes of polyphony (polyphony is how many notes that can sound simultaneously, including sustained notes). Just like most things in life, more is often better and 64 notes of polyphony will insure that you don't run out of notes, even in the most dense of musical passages. In addition to playing through the built-in speaker system, all Yamaha digital pianos have 2 headphone jacks so that you can perform to your heart's content without disturbing other family members or the neighbors and still share your music with that someone special. There is also a convenient headphone clip under the keyboard for storing them when not in use. 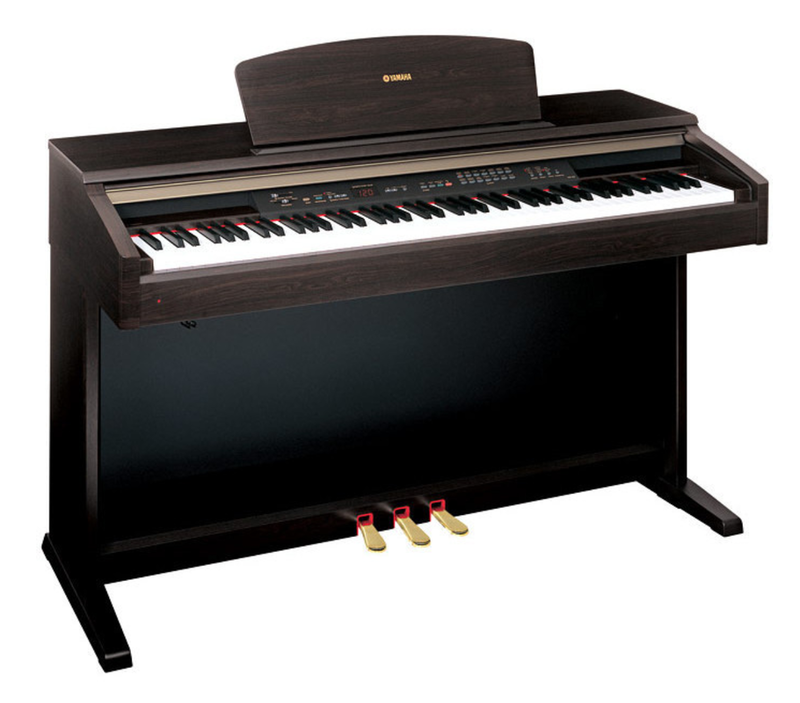 The YDP-223 features a dark rosewood finish Woodgrain cabinet with sliding key cover. You'll notice from the picture that this keyboard has 3 pedals, just like its acoustic counterparts. Also included is an LED on the panel (provides visual feedback), a built-in Metronome, Digital Reverb (simulates playing in a church or concert hall), Chorus and Brilliance controls, and Transpose which allows you to play in any key you like (great for family sing-a-longs). The instrument comes with 14 different voices for you to choose from. These include 2 Grand Pianos, 2 Electric Pianos, 2 Church Organs, 2 Harpsichords, Vibraphone, 2 Strings, Jazz Organ, Choir and Guitar. And you can combine two sounds at once, like Piano and Strings. For your learning and listening pleasure, you'll find 50 built-in songs with Songbook. And finally, there is a matching padded bench.